Creating multiple, similar assets for different end users is a regular and time-consuming occurrence in a designer’s life. Another problem is when end-users pretend they’re a designer and make changes to the branding of a piece of marketing collateral. In both cases, NetX’s AdBuilder tool makes things easier by harnessing the power of branded, controlled templates. Designers can create templates in InDesign, upload them to AdBuilder, then lock down specific parts of the design while leaving others photos or text boxes open to customization. Users can go to their AdBuilder and easily swap out photos and information, then download their design for their own use. For organizations like the University of Central Arkansas, AdBuilder has freed up the marketing team’s time, reduced frustrations for staff who were waiting on design work, and has helped ensure assets stay within brand guidelines. 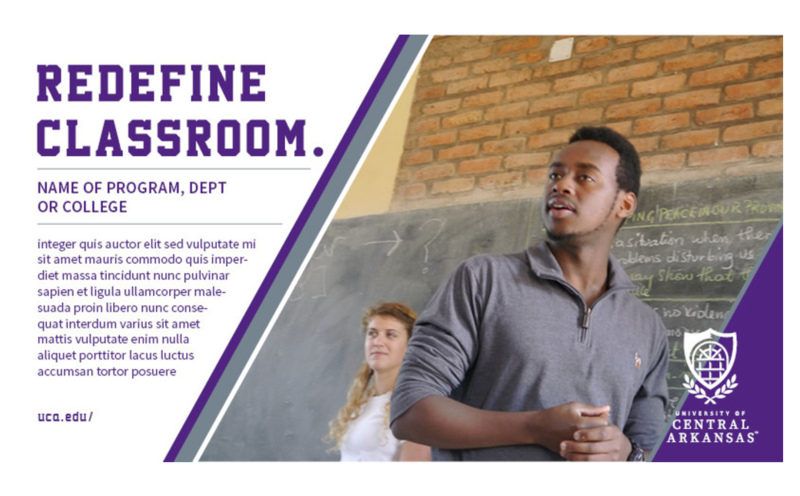 In departments all across UCA, faculty and staff aren’t just in charge of educating students, but they’re also in charge of creating marketing assets such as brochures for recruitment fairs, signage for meetings, content for social media posts, and posters for events. Before AdBuilder, they would request these assets from Kimberly Klotz, the Director of Marketing, and her small team. Because the marketing department often had a backlog of these requests, UCA faculty and staff often had to wait days for relatively minor changes. They needed a tool like AdBuilder to keep up with the needs of the faculty. In fact, the AdBuilder template feature was the biggest selling point to the University when Kimberly was trying to get buy-in to purchase NetX. AdBuilder is a simple interface that’s quick and intuitive to use, which was a critical selling point for the marketing team at UCA. And because most end users would be busy faculty, administrators or student workers, the tool needed to be as simple as possible. “I tell people if you’ve shopped on Amazon, you understand how to use AdBuilder,” says Kimberly. The marketing team also supports the end user experience by adding a second page to the back of the InDesign document containing directions for the printer. This page doesn’t display in the AdBuilder tool, but it’s part of the final file when users download the PDF, making it easier for end users to get their final files printed without having to come back to the marketing team for help. One unintended side effect of implementing the AdBuilder tool was how much creativity it sparked both with Kimberly’s marketing team and with the end users. Each department has access to a general templates area, as well as to a private section of NetX with templates for their individual department. Additionally, they can easily request new templates from the marketing department as needed. Kimberly also regularly walks around campus to see how those templates actually get used. “How I anticipated they would use a template, and how they actually do, is mind-blowing sometimes,” she says. For example, a template designed for a six-foot vinyl banner might instead be used for door signage during a meeting. “That gives me more ideas for templates,” she says. She and her team have worked closely with some of the AdBuilder’s earliest adopters on campus to gain feedback and shape what they’re creating. “Having people from the very beginning was critical,” says Kimberly. Curious how NetX AdBuilder templates can help streamline your design process and protect your brand guidelines? Request a demo today.